It's like Clue. In space. With Twiki. Imagine, if you will, a world in which face-painted men with "Flock of Seagulls"-style haircuts comingle with folks resembling Frank Zappa in Ming the Merciless attire and women dressed in the finest glittery robes dug out of the trash bin behind Studio 54 whilst relaxing on silky-cushioned, oval-shaped beds. Now imagine all of these folks are part of a mining expedition on a desolate world, utilizing an enormous vehicle reminiscent of the sandcrawler the Jawas travelled in. Oh, and there's robots: creepy, creepy robots with molded hair that looks like Louis XIV, and a murder mystery that makes everyone a suspect. That is exactly the world I stumbled into when I watched The Robots of Death DVD. I loved every minute of it, and you should too. Bear in mind, this is only my second venture in the TARDIS, having recently viewed the Doctor Who: The Face of Evil DVD, which is the story that precedes this one in continuity and the first handful of Doctor Who episodes I've ever watched in my entire life. So please forgive me if I overstate the obvious or make a grievous error in regards to Doctor Who lore. And if you read my previous review, please forgive me as I am bound to cover some of the same ground in this one. Starring Tom Baker as The Doctor and Louise Jameson as his new companion, Leela, this 90th story arc originally aired January 29 - February 19, 1977, a fact that is as obvious as it is impressive. I've often heard Doctor Who referred to as "a show that did a lot with a little" in terms of the budget, but I never understood it. The show always looked like its budget consisted of five dollars and a piece of string, with the string being forgotten at home. 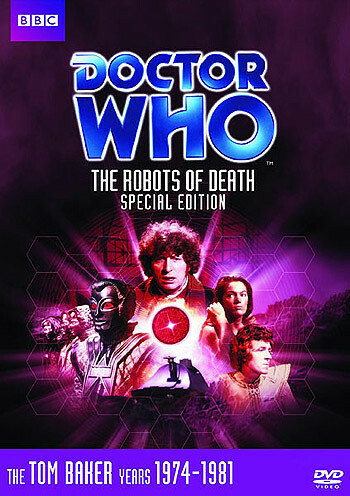 Now, I'm not sure if The Robots of Death really was leaps and bounds above The Face of Evil in terms of production value or if it was simply the fact that I was now viewing the show with a more open and educated mind, but watching this series I wasn't so much struck by what they couldn't do, but what they did do. These are people working with a budget; not against it, and what they came up with was in many cases, quite stunning. Sure, the forced perspective on the toy mining vehicle looked a bit cheesy, as did the tinfoil shoes on the robots, but the repetitive nature of the interior of the Storm Mine 4 (the enormous mining vehicle I mentioned earlier in the sentence) was almost reminiscent of the monotonous hallways of Kubrick's The Shining and the detail of the costuming, especially on the robots, gave portions of it a very timeless quality. The "Flock of Seagulls" hairstyle and strange eye makeup I mentioned earlier? Keep in mind, this was 1977. It dates the episodes somewhat, but it also makes it a bit ahead of its time. And the robots for which the series is named? Simply amazing. Yes, it's apparent that we're looking at people in costumes and yeah, they do look a bit like an aristocratic Twiki on occasion. But the Louis XIV hairstyle and clothing take the robots out of the 1970's and give them an appearance that would be just as effective if used today. The fact that the robots' faces are totally expressionless make them absolutely terrifying in their sterility. And no, it's not spoiling anything to tell you that they're terrifying; the title sort of gives it away. But enough talk about the look of the show; what about the story? As with previous episodes, I love the fact that this show makes me feel like I'm thrown right into the middle of a situation without any prior knowledge or explanation. Much like superhero comic books used to be, you pick up the pertinent information as you go and just do your best to put it all together and enjoy the ride. And much like the comic books I grew up with, it works nine times out of 10. After all, The Doctor finds himself in a completely different world at the beginning of every adventure so it's not like I'm the only one who's trying to keep up with what's what. Anyway, this time The Doctor and Leela find themselves in the midst of an Agatha Christie-style murder mystery. A small crew manning a mining vehicle finds themselves being picked off one by one. They naturally assume our heroes to be the culprits but the truth is that their robot crew is really behind it. But a robot cannot act on its own, so the question then becomes "who is giving the orders?" And like any good murder mystery, fingers are pointed at every member of the cast and each one seems like a reasonable suspect. Can The Doctor get to the bottom of the charade in time? Well, obviously the answer is yes because the show is still on the air. It was a rhetorical question. Keep reading. I guess it goes without saying that I liked it: I've made that pretty clear. While I'm still dipping my toe into the world of Doctor Who, I find myself continually impressed with the layered storylines and clever dialogue. It hasn't taken long to fall in love with The Doctor and Leela, even more impressive is how quickly I become invested in the guest stars. Simply put, this is a really well-written program and I look forward to finding out even more about these characters in future installments. I was further impressed with the fact that the series shifts gears with each story arc. Last time it was a story about technological gods and this time it's a murder mystery. But with each shift, there is still an evolving continuity in place. The stories might turn on a dime but the progression of the characters is deliberate and nuanced (even when one of the characters is a half-naked warrior woman wielding a six-inch knife). Is it a good jumping on point for those unfamiliar with the series? I don't know. But even with my limited knowledge, I suspect that longtime fans would consider this to be a fairly decent point in the series. There are a number of extras on this "special edition", including several tracks of audio commentary with producers, writers, and actors. There's also a very well-done "making of" documentary as well as studio floor plans, photo galleries, and the usual batch of assorted goodies that are included on most DVDs these days. For longtime Doctor Who fans, it should be noted that the behind-the-scenes looks are really informative and include a good number of the cast members and writers who worked on the show. Not only are they educational, they're very entertaining and it's great to see just how much everyone involved in the show really cared about it. Once again, The Doctor has paid a house call and once again, I've found whatever ails me to be cured. Another highly recommended release from the BBC.